You will earn 4,140 Reward Points. Earn 1 reward point for every 1 dollar spent. Dutch doors (VBP15 and VBP18). Integrated steel frame for maximum strength. Fully insulated with 1 1⁄2" in side walls and 2" in top. ENERGY STAR® qualified (except for model VBP18). Blower motor for gentle and even temperature distribution. 5" heavy duty casters (2 swivel with brakes and 2 rigid) (3" on VBP5). Interior and the exterior are both constructed out of 20 gauge stainless steel. Simple knob actuated electronic control for holding at temperatures of up to 190°F. Complete with cord and plug: NEMA 5-15 for 120 volts and NEMA 6-15 for 208-240 volts. Universal tray slides adjustable on 1 1⁄2" centers. VBP15 & VBP13 ship with 10 pairs of tray slides. VBP7 & VBP5 ships with 5 pairs, VBP18 ships with 15 pairs. 18" x 26" sheet pans. Other pan sizes on shelves. 12" x 20" pans, or a combination of both on 1 1⁄2" centers. Vulcan Hart Model No. 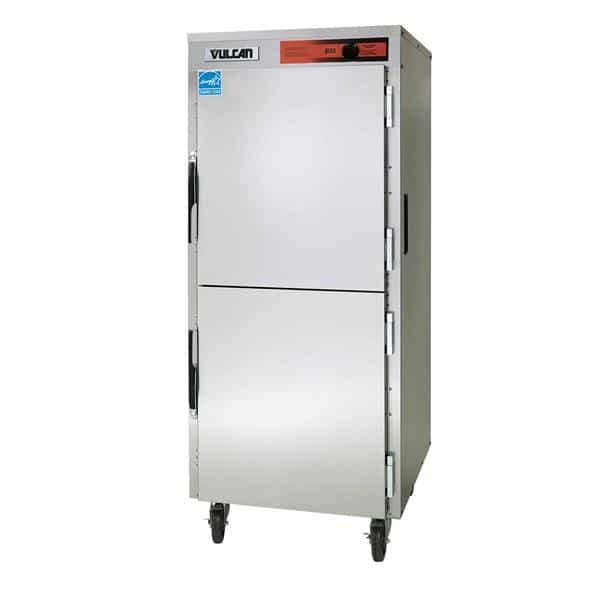 VBP heated holding and transport cabinets. Blower motor for gentle and even temperature distribution. Complete with 5" heavy duty casters (2 swivel with brakes and 2 rigid) (VBP5 has 3" casters). Simple knob actuated electronic control for holding at temperatures up to 190°F. Adjustable racking will hold 18" x 26" or 12" x 20" pans or a combination of both on 1 1⁄2" centers. Lip-load racking will hold 18" x 26" pans on 1 1⁄2" centers. Shelving will hold a variety of pan sizes. Complete with universal tray slides adjustable on 1 1⁄2" centers. Cabinet interior and exterior are both constructed out of 20 gauge stainless steel. Recessed side-mounted handles, magnetic action door latch, and full insulation; 1 1⁄2" in side walls and 2" in top. Integrated steel frame for maximum strength. Field reversible doors. Complete with rear mounted cord and plug: NEMA 5-15 for 120 volts and NEMA 6-15 for 208-240 volts. One year limited parts and labor warranty. After the first year, lifetime parts warranty on the heating elements. ENERGY STAR® qualified (except for model VBP18).